Information Technology at UCSF selected 5 proposals for funding. The winning teams had seven weeks to work on the projects. An awards ceremony took place on October 12, 2012 as part of the IT@UCSF Sharecase conference at Mission Bay campus. UCSF Profiles and Salesforce Chatter at UCSF: the perfect complementary tools. Here’s the answer to: Why aren’t these 2 systems already integrated? Submitted by Leslie Yuan on July 31, 2012 - 8:56am Last revised by Web Producer on August 25, 2014 - 10:06am. Have you ever found a group of experts on UCSF Profiles that you wanted to bring into a conversation, but didn’t want to inundate with long email threads? Have you ever found someone on UCSF Profiles who is doing work on a topic of interest and you wish you could “follow” them so you’d be notified automatically of any new publications they put out? Read more about UCSF Profiles and Salesforce Chatter at UCSF: the perfect complementary tools. Here’s the answer to: Why aren’t these 2 systems already integrated? Submitted by Thomas Mcmanus on July 27, 2012 - 10:30pm Last revised by Web Producer on August 25, 2014 - 10:07am. DESCRIPTION OF THE PROJECT. Managing unique scientific research materials is a problem faced by almost all labs at UCSF. In addition, sharing between labs is difficult since there is no common inventory system, or method of keeping potential collaborators up to date on the materials available among UCSF labs. Here we describe an easy solution for sharing lab resources among collaborating labs and larger networks. In short, we will build a Drupal module that will allow scientists to communicate their sharable reagents. Submitted by Raman Khanna on July 27, 2012 - 2:05pm Last revised by Web Producer on August 25, 2014 - 10:06am. Description: ZipRounds (ZR), a Salesforce Chatter-based collaboration tool, revolutionizes in-hospital communication. ZR enables providers to send, receive & store patient-related messages in an easily searchable, indexable & retrievable way. Submitted by Anirvan Chatterjee on July 27, 2012 - 10:57am Last revised by Web Producer on August 25, 2014 - 10:06am. 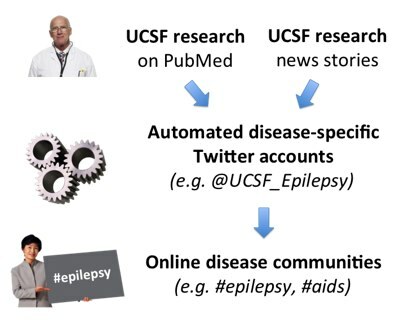 Synopsis: Develop a suite of datafeed-driven disease-specific UCSF Twitter feeds (e.g. @UCSFDiabetes) to promote and disseminate UCSF disease-specific research more widely and engage thousands of members of disease communities (patients, family members, students, funders, health care providers, policymakers). Apply social media outreach best practices to extend reach. Project builds on a successful demo, and is designed to be potentially scalable to dozens, perhaps hundreds, of disease areas, to support existing campus communications work in disease-specific communities. Submitted by Pranathi Sundaram on July 27, 2012 - 6:25am Last revised by Web Producer on August 25, 2014 - 10:06am. Goal: Streamline employee on-boarding process by establishing seamless and automated communication to IT support units within minutes of when new employee data has been entered into the HR OLPPS system. This is to enable quick turn around for providing access to UCSF and departmental IT resources. The aim is also to enable notification for when an employee is departing from the University so IT staff are able to proactively engage in following exit procedures such as recovering equipment, securing data and obtaining the signed Electronic Information Consent form. Submitted by Richard Tabor on August 3, 2012 - 9:30pm Last revised by Web Producer on August 25, 2014 - 10:06am. come or will come at all (just kidding). wait for the shuttle and even more importantly, not miss an early shuttle. Submitted by Richard Tabor on August 3, 2012 - 8:10pm Last revised by Web Producer on August 25, 2014 - 10:06am. that is across the room, laptops) none of which is very efficient. with this front end process. Submitted by Paul Franke on August 3, 2012 - 5:08pm Last revised by Web Producer on August 25, 2014 - 10:07am. UCSF maintains up-to-date building and floor plans for all University owned buildings. Submitted by Andres Elenes on August 3, 2012 - 4:37pm Last revised by Web Producer on August 25, 2014 - 10:07am. Our goal is to integrate & leverage existing UCSF resources to change (for the better) how our community interacts with its data thereby bringing file sharing and collaboration @UCSF to the future all while minimizing risk exposure. Submitted by Suzanne Colorado-Caldwell on August 3, 2012 - 10:46am Last revised by Web Producer on August 25, 2014 - 10:06am. This proposal outlines a project for developing, deploying, and supporting a UCSF Committee Service and Management Portal built on the UCSF Salesforce platform and leveraging Chatter capabilities.